Why Do The Most Dangerous Scorpions Have Tiny Hands? It is true that 'some' scorpions with small hands are medically important and it is true that 'most' scorpions with small hands are more toxic than those with larger hands, but that's about as correct as the misconception gets. There are two extreme morphologies in scorpions, those with small or tiny pedipalps and those with medium-large pedipalps (referred to as Form 1 and Form 2 below). It is a well known fact that those scorpions with small hands are often the most venomous and are the ones responsible for human deaths. As a result of this, the popular explanation is that more powerful venom is needed when you have small hands, because clearly you can’t crush your prey, or hold it as easily as a scorpion with large powerful hands. I will explain why this popular explanation is wrong and give a far more plausible hypothesis as to the stronger venom of small handed scorpions. Form 1: Some families of scorpion including the Buthidae contain the most medically important species in the world. They are readily recognised by having a combination of tiny hands and arms (pedipalps) and a comparatively large tail (metasoma), which they almost always have arched above their body ready for action. These scorpions are opportunistic, which basically means they take advantage of the benefits of itinerancy. Many do not occupy a burrow home or rock scrape at all, instead they move about. However, some will have more of a fixed home base, but these are in the minority. One thing they all have in common is that they actively wander about seeking prey. They do not use the sit and wait method utilised by Form 2 scorpions, at least not in the same way. There is a major distinction. These scorpions when out foraging DO NOT have a home base to take their catch to, they consume their prey where it was located. Form 2: Other families, including the Australian Urodacidae or Hormuridae , include those forms with relatively large pedipalps. These forms usually have a metasoma of more acceptable proportions, it is rarely unusually large as it is in the Buthids. We might have the opposite extreme as is the case with the Hormuridae, where the pedipalps are disproportionately large and the metasoma disproportionately small. Just what is going on here? These are the true sit and wait predators of the scorpion world, they are often stable in their selection of a home base, rarely moving far from their initial place of dispersal. They occupy permanent burrows or rock scrapes and either catch prey at the home base or very near to it. When a prey item is captured it is normally taken into the safety of the burrow or rock scrape for consumption. What drives the different body forms? As with venom toxicity, body shape is also under the influence of natural selection. Body forms of scorpions are a reflection of the way they choose to live their lives. How do the different forms evolve? Comparison of the two forms: We can see there is a clear distinction between the way Form 1 and Form 2 catch and consume their prey. Form 1 takes prey while out foraging and they may be a long way from any safe refuge. A good example of this can be seen in the Salt Lake Scorpion, Australobuthus xerolimniorum. These opportunistic scorpions take refuge during the heat of the desert day amongst vegetative debris lining the shorelines of inland dry salt lakes. When night comes, they take to the salt lake surface to forage and can often be found up to 100 metres off shore. Their prey items consist of small insects such as flies resting on the salty surface and a variety of other small insects and spiders also out foraging. It would be unrealistic for this scorpion to catch a prey item and then cart it all the way back to the shore, and of course, this doesn’t happen. Instead, the scorpion consumes its catch out in the open, exposed to potential predators. This is a common scenario for those species that roam in search of their food. This method of foraging and feeding leaves the scorpion open to predation to a far greater degree than those Form 2 scorpions. If you are a scorpion covering large distances to find prey, you need to be agile and have the ability to move quickly and economically. The last thing you need is a huge pair of heavy pedipalps to haul about. They would mean a larger transport energy budget for the night and increased visibility to potential predators. Natural selection favours those opportunistic scorpions with agility, low energy expenditure and decreased visibility. If you think about the physics of the pedipalps and the way in which scorpions carry them, it should be obvious that large ones are cumbersome and energetically expensive. They are fine for those scorpions that don't wander long distances or frequently climb up into bushes. It should now be clear why foraging scorpions have evolved small pedipalps. But what about the disproportionately large metasoma? Having small pedipalps means catching small food items of which there are plenty available on a summer’s night. Many foraging scorpions have very long fingers, perfect for snaring the wings of a moth or the spindly legs of a roaming wolf spider. Small food items are quickly consumed. Many opportunists are desert dwellers and not surprisingly most regularly sting their prey, as they don't have time for a casual approach when perched on top of a dune. 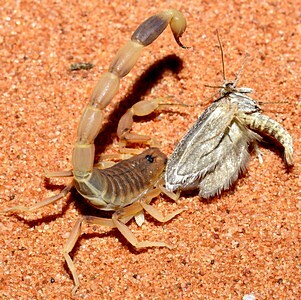 Also, If a scorpion has just caught a moth on an open sandy embankment, it will not be favourable to have the wings of the moth beating violently, signalling to potential predators that something is going on, a swift envenomation quickly ceases movement, increasing the likelihood of the scorpion not being detected. Foraging scorpions have become specialists at capturing smaller food items and consuming on the spot. They have a evolved a very different strategy to the sit-and-wait 'at home' predators. The strategy is to be mobile and go after prey, rather than wait for it to come to them. This means they consume a larger number of food items, as they are generally smaller, not to mention the extra energy involved in locomotion. Some species will sit and wait on vegetation or under a small piece of ground debris such as a small stick or bark. This method allows some form of protection from predators and saves energy while waiting for and consuming prey. Form 2 predators have a very different story to tell. They expend little energy on transport, they aren’t restricted in the size of their pedipalps as they don’t need to carry them about the countryside every time they are hungry. In fact, as they usually trap food right outside their door step, it’s an advantage to have large pedipalps as larger food items can be caught and consumed. There is little danger of predation while nestled away inside their burrow or rock scrape. Envenomation is not necessary as it's unlikely any predator will notice what is going on under a rock or in a burrow. However, even food items such as ants that cannot be envenomated due to their small size will often be killed by dragging back and forth in the sand. It seems many, but not all scorpions, simply prefer to consume dead food and so most Form 2 scorpions will also sting their prey. Venom Toxicity: Do you still think our small handed scorpions, the most dangerous types in the world, carry highly toxic venom to enable them to overcome prey? Do you think more powerful venom is needed to overcome a fly, or small hemipteran or wolf spider? Ordinarily, any one of these food items would first be grabbed before envenomation. Scorpions have very strong grip, it is very unusual to see a prey item escape once caught. So, it isn’t about size, if the scorpion cannot handle the potential prey item, it will likely give it a miss entirely. I have witnessed many types of scorpion handling prey and the majority of scorpions from both Forms will choose to sting their prey. Some adult scorpions from Form 2 have developed such large and powerful hands, that they don't need to envenomate and therefore choose to crush kill, these are in the minority and I am not familiar with any in Australia. However, as juveniles, even these types will envenomate prey. In fact, one of Australia’s largest scorpions, Urodacus elongatus, a Form 2 rock scrape dweller nearly always stings its prey. It has large pedipalps and is a sit-and-wait predator at its rock scrape entrance. Surely, of all the Form 2 scorpions in Australia, this one should be a major candidate for consuming prey without envenomation. However, don’t get me wrong, I have seen this species consume live prey without envenomation, but, it’s in the minority of observations. So, the conclusion here is that scorpions from both Forms in general will envenomate their prey prior to consumption, even when it is apparent they don't need to. So what is going on? Scorpion venom plays two major roles, one is to overcome prey and the other is to reduce the chances of death by warding off a potential predator. So strong is the latter that some organisms have evolved the ability to mimic the action of the scorpions arched tail and in doing so, reduce the chance of predation - Batesian Mimicry. Some suggest venom may play a digestive role as clearly it is unnecessary for a large, powerful scorpion to envenomate its small prey item and yet, it still often will. I find this theory unlikely, as in my experience a scorpion will also scavenge and if offered a freshly killed food item it will usually not envenomate prior to consumption. Possibly the scorpion simply finds the meal easier to deal with if it is not struggling. Regardless of the reason, prey envenomation takes place to one degree or another across the entire scorpion order. Another aspect to consider is that each instar will often utilise a different type of prey item, adult food items may be too large or younger instars may forage at different times to their older cohorts thus avoiding cannibalism and therefore interacting with a different set of potential prey and predators. As a result of this there will be varying selection pressures throughout the life of the scorpion. Changes in morphology can independently alter toxicity and use of the metasoma as seen in the Australian rainforest, rock space dwelling, Hormurus spp. These scorpions no longer rely on envenomation as a form of defence, instead they have taken a different path. They have evolved disproportionately large pedipalps, not in order to capture larger prey items, but as protective blocking armour when lodged in a rock space. With arms folded across the face of their body forming an impenetrable barrier, there is little chance of dislodgement. The pedipalps have become so big it appears the metasoma and its venom have experienced reduced selection pressure, resulting in diminished size of the metasoma and reduced toxicity. Why has this occurred? As this scorpion occupies rock spaces it rarely uses it’s telson for defence, and in doing so, the telson and stinging behaviour have taken a back seat in the theatre of natural selection. In fact, what has happened is that the metasoma has been under pressure to be reduced in size in order for the scorpion to squeeze into tighter spaces. The result is that we see a rather weird looking scorpion with huge pedipalps and a tiny metasoma. 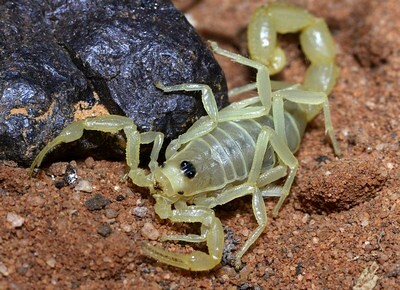 Many people will think the tiny metasoma and low toxicity is the result of the scorpion having large pedipalps and therefore not needing to envenomate prey, when in fact the unusual morphology and low toxicity is the result of occupying tight rock spaces. These scorpions have also developed a dorso-ventrally flattened body with the ability to move in any direction without turning. As selection pressure on toxicity is minimal, the venom has gradually reverted back to a mildly acting toxin strong enough for younger instars to kill prey items with. Adults of these types of scorpion rarely ever envenomate prey and when they do, the metasoma is brought around to the prey laterally. Form 2 scorpions have few battles with predators and as a result have a relatively weaker toxicity than Form 1 types. Some Form 1 types also experience little interaction with predators and as a result have low toxicity. The relation to the effectiveness of killing prey is an obscure one and in fact may not even be related. However, it would seem possible that a powerful pain causing venom, capable of warding off or even killing a potential predator will have a stronger action on prey items, but of course this is the result of predator selection and independent of prey killing effectiveness. If a scorpions most common prey items are small insects, it isn’t going to matter if the toxicity of the venom is low or high, it will still be effective and it's unlikely pressure for a more toxic venom would occur once a threshold is reached. This is readily seen in small opportunistic species that occupy leaf litter and have minimal interaction with predators. Predators drive scorpion toxicity, it has nothing to do with the size of the hands. A comparatively large metasoma is the result of natural selection favouring those scorpions that not only have a comparatively powerful venom, but that which can be actioned, and a large, powerful tail will be more effective at delivering the punch than a small one. This is one of the reasons why some of the most dangerous species have very large and powerful tails. It's no good having powerful explosives if you have no way of effectively delivering them to the target, and some targets can be difficult to penetrate. What can we say about Urodacus yaschenkoi? Why does it have a more powerful toxicity than some Form 1 scorpions, surely that flies in the face of the popular misconception? Males of this species need to go in search of females during mating season and daily burrow entrance maintenance by all cohorts exposes them to potential predators. Australia has many desert adapted, nocturnal, insectivorous marsupials, most of which are either extinct or only exist in small relict populations. Scorpion such as U. yaschenkoi, would have been considered a significant feed and so predation would have driven this species to evolve a venom strong enough to ward off most predators. This is the only scorpion I have ever witnessed spray venom as a fine mist, I can imagine getting it in the eyes would be effective in keeping an insectivorous marsupial at bay long enough for escape. In this case we have a scorpion with features from both Forms, large Form 2 pedipalps and a rather powerful venom. Another scorpion that defies the popular misconception is our salt lake scorpion, Australobuthus xerolimniorum. It is clearly a Form 1 scorpion, it has all the features and is opportunistic as previously discussed, but it has a relatively mild venom, I know from first hand experience (pun intended). Why would this scorpion have a mild venom when it spends so much time out in the open, surely it would be exposed to predators? If using the logic of our popular misconception, we might consider it doesn't need powerful venom as it only preys on small arthropods, but of course we know better than that, there are plenty of species that prey on similar items with powerful venom. The answer is pretty obvious when we look at the environment in which it forages. Salt lakes are open, barren environments, other than the occasional piece of wood or bush washed from the surrounding dunes after a downpour. What insectivorous marsupial would be game enough to wander out onto such an open unprotected environment? It wouldn't take too long before nocturnal birds of prey discovered a very easy feeding ground. Our salt lake scorpion completely lacks pigment and is virtually impossible to see from the air and hence has very few predators, in fact it may well be near the top of the food chain in its environment. With few predators to deal with, this scorpion has not been under pressure to evolve a highly toxic venom. 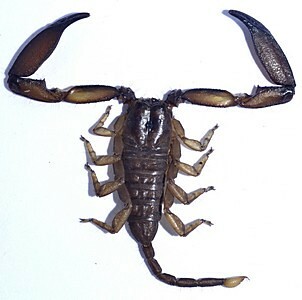 I have discussed scorpions that oppose the popular misconception, what about a typical Form 1 example from Australia? 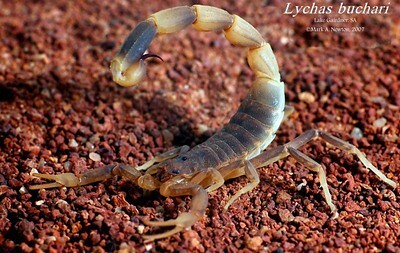 Lychas buchari is an arid adapted dune scorpion occupying dunes surrounding salt lakes where A. xerolimniorum is found. It would have to be the most aggressive and potentially toxic of all the scorpions I have worked with, why? You will see its image above, you can't miss it, it's the scorpion that simply looks like it's ready for action. I gave it the common name 'Fierce Scorpion', and for a very good reason. I placed a cricket near this scorpion and watched in amazement as the metasoma flashed in the blink of an eye, leaving the unlucky cricket stone dead. My eye was not quick enough to see the movement properly, the aculeus (stinging barb) could have only been in the cricket for no more than 1/1000 of a second and yet, it ended the cricket instantly. Pedipalps were not used. Why? I have cheated a little here. This scorpion was in predator threat mode. Whilst taking photographs I needed to usher the scorpion into the centre of the large icecream container used as a macro studio. The scorpion considered me a predator and was ready for action. This species actively forages on open dune areas where marsupial predators would once have been plentiful and as a result has evolved aggression, speed and a venom with high toxicity. Why are there so few lethal scorpion species in the world? There are in the order of 1500-2000 species of scorpion world wide, but only a very small handful would ever be considered lethal to humans or even most animals for that matter, but they all cause pain to one degree or another. Those predators that on average died after envenomation would have a lower chance of passing on genes than those smart enough to learn after experiencing the pain. Eventually, natural selection would produce predators with innate instinct to either be very careful or stay away from the scorpion, and as stated earlier, this is reflected in those creatures that mimic scorpions. It is an evolutionary advantage to have your potential predators learn that you are dangerous. It wouldn't work if they died, learning would never take place, there would simply be a more rapid evolution of more powerful predators capable of surviving the envenomation and that would mean problems for the scorpion. Just as a parasite needs to keep its host alive, so a scorpion needs to keep its predators alive. • Predator – Prey interaction has resulted in opportunistic scorpions developing relatively powerful toxins. • Tiny hands/pedipalps in Form 1 scorpions are the result of selection for increased mobility with reduced energetic costs. • A relatively large metasoma in Form 1 scorpions is the result of predator-prey interaction. • Large hands/pedipalps in Form 2 scorpions are the result of a relatively sedentary lifestyle and a home base in which to consume food. • Extremes of both Form 1 and Form 2 exist along with many scorpions showing features to a varying degree of both Forms. • Form 1 and Form 2 are influenced by various factors including but not restricted to: Sedentary or vagile way of life - Degree of exposure to potential predators - Types of predators encountered - Types of prey items encountered - Types of home space - Types of habitat occupied. The Popular Misconception: It can be seen that scorpions with small hands/pedipalps have not evolved a greater level of toxicity to enable them to overpower prey. Too many examples of Form 1 scorpions exist that contradict this argument. Many Form 1 scorpions are small and prey on small food items; they do not require more powerful venom to handle such prey, there simply is no reason to suggest they would. They do however experience a far greater frequency of interaction with potential predators than their Form 2 cousins, and in doing so have evolved a greater level of toxicity. Many Form 2 scorpions also choose to envenomate their prey, even those with large hands/pedipalps. The popular misconception has no sound basis and is probably the result of simply concluding that small hands must have difficulty in handling prey and hence a powerful envenomation is necessary. This argument is clearly incorrect.